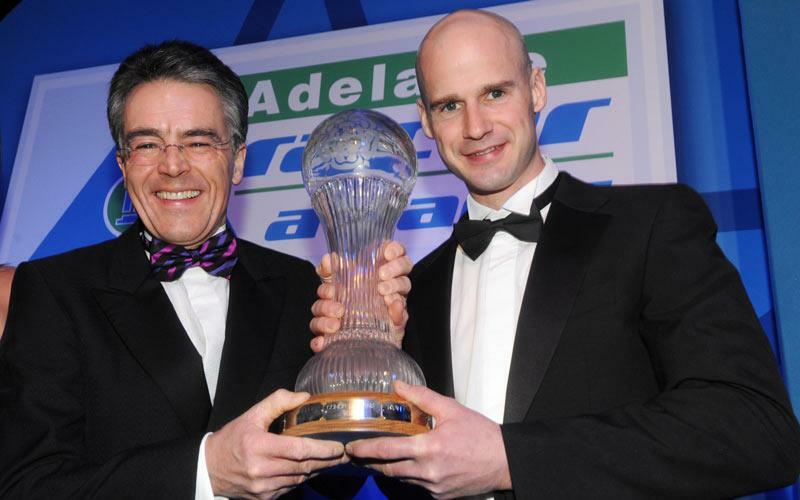 The prestigious Geoff Duke Trophy was presented to 2010 Duke Road Race Rankings winner Ryan Farquhar at a star-studded ceremony in Belfast by Peter Duke, Managing Director of Isle of Man-based Duke Marketing. In front of an audience of racing legends and current stars of the World, British and Irish racing scenes, Duke handed over the handsome crystal trophy to Dungannon’s Farquhar. It is the fifth time Farquhar has won the Duke Road Race Rankings, and the third time in a row he has topped the points table. In recognition of this achievement, and to honour a promise made by six-times World Champion Geoff Duke O.B.E., Farquhar now keeps the trophy, rather than a replica as in previous years. As the Duke Road Race Rankings marks its 10th anniversary, a new trophy is being created and Farquhar has already stated his intentions to win that as well! The Duke Road Race Rankings is the only award which measures performance across the entire season of racing on pure road circuits, including national events and international races, such as the TT and Ulster Grand Prix. It ensures those riders who show commitment to the roads throughout the year are recognised for their efforts and achievements. For the past three years, the scene has been dominated by Farquhar, most recently with his own KMR Racing team. Still performing to the highest level at international meetings, including two fabulous podiums at the 2010 TT, Farquhar is also a regular at national events on his self-built fleet of Kawasaki racing machines. During 2010 he took 57 race wins in rankings’ races, nine second and five third places, and 51 fastest laps, 19 of which were record laps! His final points tally was 4,444, double the haul of nearest rival William Dunlop, who was closely followed by brother Michael and the star of the 2011 TT Ian Hutchinson. During the evening, Farquhar again confirmed he will contest the full 2011 season, with Kawasaki machinery, and is targeting even more wins, including the elusive ‘big bike’ victory at one of the international meetings – and that means he starts this year’s Duke Road Race Rankings as undoubted favourite yet again. The Duke Road Race Rankings celebrates its 10th year in 2011 and has gone from strength to strength over the decade. This year’s provisional calendar, which is due to begin with the Ian Watson spring Cup at Scarborough on April 17, boasts 26 meetings, and is planned to run until November 9 and the season-closing Macau Grand Prix, which joined the schedule in 2010 for the first time.